The intercooler is a crucial part of a turbocharged cars engine. It improves efficiency and power by cooling the air entering the combustion chamber, therefore increasing density and compression. Simply, they give your car more horsepower. As a turbocharged car is modified, under hood temperatures increase and more cool air is required to mix with the increased fuel use. A factory intercooler simply cannot keep up. The key to increasing cooling is increasing surface area. To do this you must make the intercooler larger or thicker. Only then can the engine reach its full potential for making power. Spearco is synonymous with quality intercoolers. 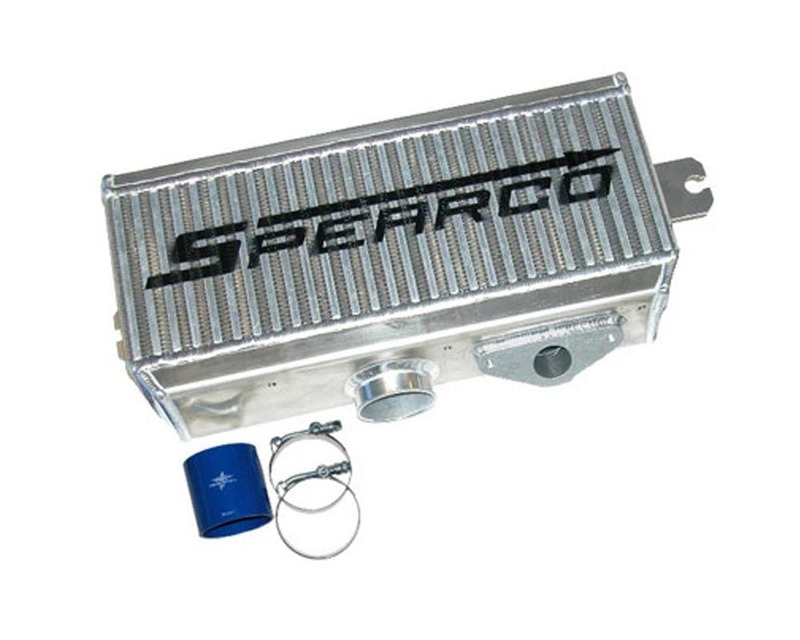 Spearco’s WRX intercooler kit features the largest air-to-air top-mount intercooler on the market. Increased size and volume means more surface area which is of utmost importance when it comes to heat dissipation and efficient cooling. Cooler air is denser, meaning more air/fuel can enter the engine, giving you more horsepower. Utilizing the factory mounting points, the massive 4.5"-thick unit bolts on easily without any modifications to the vehicle. Factory turbo piping and blow-off valve can be bolted on easily with standard hand tools. Due to Spearco’s manufacturing process, these unique cores are capable of comfortably withstanding pressures in excess of 200+ psi. W.A.V.E. Technology cores set the standard for high-pressure forced-induction durability and cooling effectiveness. Whether you need a high altitude generator to maintain power, have an extreme temperature hydraulic cooler need or are just seeking the peace of mind of knowing that you have the strength and design integrity of the Spearco brand, W.A.V.E. Technology heat exchangers, intercoolers, hydraulic coolers and radiators are for you.